A pretty origami fish is a cute decoration and a fun way to push your origami skills. This traditional origami model is easy and only takes a couple of minutes to make. Since it's not too hard, it's great for kids to make. This traditional origami fish starts with an origami windmill base (which is shown). Once you master the traditional fish, there are many ways to decorate them. You can create a whole school of fish in various colors. Another creative idea is to make an origami Shikishi, which is a themed display. For this Shikishi, you can make an aquatic display. Use some blue paper, put some fish in the water, add a Turtle, maybe a sailboat on top, perhaps an Origami Swan, and make a pretty scene to display in your home. 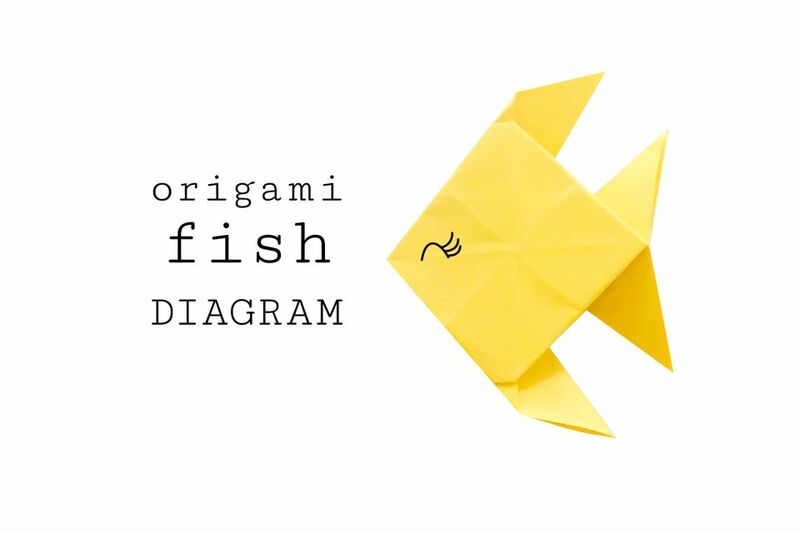 This origami diagram should be helpful to work with to make your fish. When following origami diagrams, it's useful to look at the step you need to do next, as well as the one after that to see what it needs to look like. Don't worry if you don't succeed at first. Origami takes practice. For this fish, you'll need one sheet of square origami paper. It is best to start with regular 15 x 15 cm origami paper. 1. Fold the paper in half both ways and unfold. 2. Fold the left and right edges to the middle. 3. Fold the top and bottom edges to the center. 4. Unfold the top and bottom flaps. 5. Pull the left and right flaps from the middle up and out to the sides. 6. Squash the bottom edge to the center. 7. Now repeat steps 5 and 6 on the top section. 8. Fold the top left and bottom left points as shown. 9. Fold the corner with the green dot up to the red dot. 10. Fold the flap down from the center as shown. 11. Fold the corner with the green dot down to the red dot. 12. Fold the flap down from the center as shown. 13. Fold the top and corners to the right as shown. 14. This is what it should look like. 15. Flip the model over to the other side. 16. Now you can push the mouth area in a bit and draw an eye. For a playful fish, feel free to add on eyelashes. If you want, you can draw a mouth as well. You can make a smiling mouth, puckered lips, or anything else to give your fish a personality. Remember that origami can take practice. Make another one and it will be better than the first one! For more tutorials and also video instructions, look at Paper Kawaii on YouTube. If you are stuck on a particular step, watching a video of the fold in action can be quite helpful.